We are what we eat! When ruminant animals are fed on grass, they are eating their native diet. This means that they are in a living environment to maintain optimal health, and produce more nutritious meat. Grass fed beef is lower in total fat and saturated fat than grain fed beef. 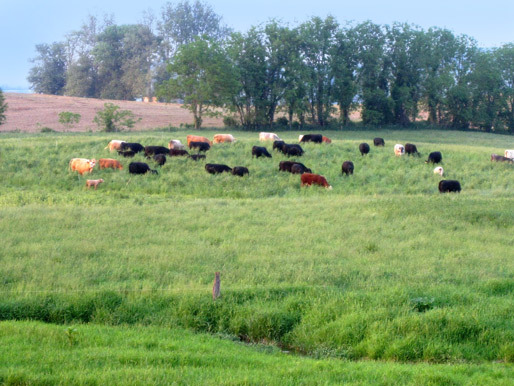 100% grass fed animals such as ours do not eat grain, and therefore do not consume GMOs. Grass fed beef is higher in brain-healthy Omega 3 Fatty Acids, Vitamin E, C & A, Beta-Carotene, & CLAs (conjugated linoleic acids), which has been proven to reduce cancer & heart disease risk. Grass fed beef does not face the same health problems as grain fed beef. Grain feed is not natural and causes digestive distress and higher rates of E. coli bacteria making grass fed beef safer for your family. Grass fed animals grow at their natural pace and live a low-stress life outdoors –therefore, they are healthy and they do not need treatment with antibiotics or other drugs. This site has a wealth of information about the benefits of grassfed meats, food safety, essays, links and much more.